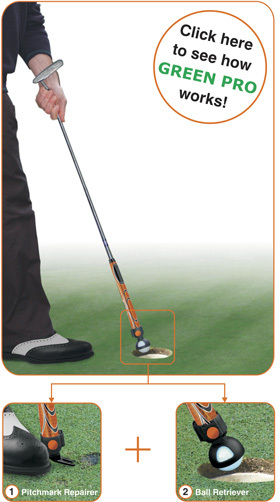 GREEN PRO is a revolutionary, patented golf accessory, designed to allow golfers to retrieve their ball and repair pitchmarks whilst standing - saving their backs and the greens! 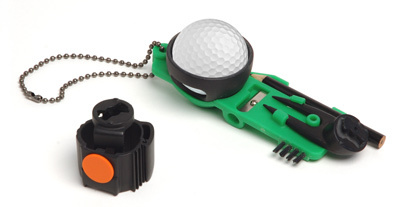 GREEN PRO is an invaluable aid to the many millions of golfers around the world who will now not have to repeatedly bend down to retrieve their ball or repair pitchmarks. 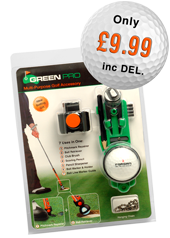 It's also an ideal golfing gift for Birthdays, Christmas, Mother's and Father's Day.